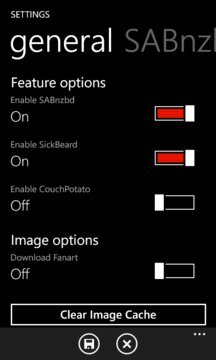 MediaHub is a remote control application that will allow you to connect to and control SABnzdb, SickBeard and CouchPotato (V2) from an intuitive Windows Phone User Interface. - Watch and manage your download queue, including pause/resume, set speedlimit, delete items and change details. - Watch items in your history, retry failed downloads and clear completed. - Search for and add NZBs directly to SABnzdb. Currently supports generic newznab API. - Add live tile that takes you directly to newznab search page. - See which episodes will be available soon and get episode summaries. - Get an overview of, and manage, your watched TV shows, including pause and delete shows, and force search for individual episodes. - Get a list of all episodes of a TV show and see episode descriptions and status. - Enable posters and fanart for your shows. - Change status of individual episodes. - Edit show quality (initial and archive). - Quickly do manual search for a episode using newznab. - Manage which movies you want and what quality you want them in. - See which movies you have already downloaded and get movie info, such as directors, actors and plot description. - Get more information with direct links to IMDB. - Enable posters and fanart for your movies. - Get suggestions for movies you might like. - Quickly do manual search for a movie using newznab. - DNS lookup that enable the use of services such as dyndns or no-ip.org. - Added an optional path (header redirect) that let you place SABnzbd on e.g. http://:/SABnzbd and Sick Beard on e.g. http://:/SickBeard etc. Also, get a nice and convenient list of all your latest acquisitions, and enable live tile to get "at a glance" information about how much your server is working when you're not looking.